Equatorial Guinea’s Ministry of Agriculture and Forestry, Teodoro Nguema Obiang Mangue, rewarded the national team, Nzalang, for its victory against Libya the Africa Cup of Nations (AFCON) inaugural match. Minister Nguema delivered the promised bonus in his capacity as President of the Federation of Youth of the Equatorial Guinea Democratic Party (PDGE). "The match was very important for the people of Equatorial Guinea, because it is the first time that an event of such a magnitude was held in our country, and even more so being the inaugural match," said Minister Nguema. "All the factors came together in order to be able to transmit to you the solidarity of the people. You have demonstrated our pride in this encounter with a brilliant victory that reassured us and encouraged us to achieve further triumphs." Minister Nguema rewarded the Nzalang with 500 million CFA francs (approximately one million dollars) for their first victory and awarded two other payments of ten million CFA francs each (around 20,000 dollars) to the scorers of the team’s two goals, one of which was annulled in a controversial decision. He continued to encourage the team and ensured the players and the nation that he will the maintain the incentives throughout the tournament. The Nzalang won its second match of the AFCON, against Senegal, yesterday and Minister Nguema will reward the team again in the upcoming days. Bata, the country’s largest city, once again overflowed with excitement over the success of its National team, Nzalang. The team’s upcoming match against Zambia will be played this Sunday, January 29, in its capital city of Malabo. Equatorial Guinea recently launched a new telecommunications company, GECOMSA (Guinea Ecuatorial Comunicaciones Sociedad Anónima), to better serve the rapidly developing country’s communications needs. This is an effort by the government to overcome the sector’s limitations, which are currently operated by two companies, GETESA and Hits. During the launch of GECOMSA, María del Mar Bindang Eneme, GECOMSA Director, stated that the telecommunications company’s main goal is to improve and guarantee mobile telecommunications as well as Internet services for its subscribers. GECOMSA, the third-largest mobile phone and Internet company in Equatorial Guinea, is a joint venture between the government of Equatorial Guinea, which has a 51% stake, and China, with 49%. Equatorial Guinea’s Minister of Mines, Energy and Industry, Marcelino Owono Edu, finalized new agreements on the implementation of the liquefied natural gas (LNG) Train II project on January 17, 2012 in Lisbon. The agreements distinguish the key areas of the project, taking them a step closer toward implementation. LNG Train II follows the development of LNG Train I, which was opened in May 2007 to monetize the expansive gas reserves throughout the country. It produces approximately 3.7 million tons of LNG a year, making Equatorial Guinea the third-largest producer of LNG from the African Atlantic basin. The success of Train I spurred the development of Train II, with the idea of making Equatorial Guinea a regional gas hub. “Equatorial Guinea is determined to continue to develop the gas industry and compete in the Atlantic Basin market,” said the Delegate Minister of Mines, Energy and Industry, Gabriel M. Obiang Lima. In addition to Minister Owono, the agreements were also signed by SONAGAS GE (the national oil company of Equatorial Guinea), Glencore, Atlas Petroleum and Osborne Resources and the partners of Block R, among others. The next step in the development of Train II is to define the project scope, which will include the plant size and timing of the project. The goal is to have the first production of LNG shipped by 2016. Equatorial Guinea opened the 28th Edition of the Africa Cup of Nations (AFCON 2012) with a match against Libya in the newly remodeled Bata Stadium, where the Nzalang won its first victory. President Obiang Nguema Mbasogo boosted cultural development exchange between African youth. Bata, the country’s largest city, was filled with excitement and support for its National team, Nzalang. The streets of Bata were a virtual sea of red throughout the day as thousands of residents donned the red jerseys of the Nzalang, and the stadium was roaring with excitement a full three hours before the start of the game. AFCON is the most important tournament the country has ever hosted. The impressive pre-game show featured a performance by Anfibio, Equatorial Guinea’s most famous popular singer, and his group, who performed all along the perimeter of the stadium to loud cheers. They were followed by folk dancers, a multimedia tribute to African biodiversity, and a colorful performance by children in honor of the youth of Africa. The ceremonies ended with a spectacular fireworks show that enveloped the entire circular stadium. Aniceto Ebiaka Mohete, Equatorial Guinea’s Vice Minister and Honorary President of the COCAN, noted the significant economic development that is taking place in Equatorial Guinea, and said that hosting AFCON marks another step in Equatorial Guinea’s journey toward its Horizon 2020 development goals. 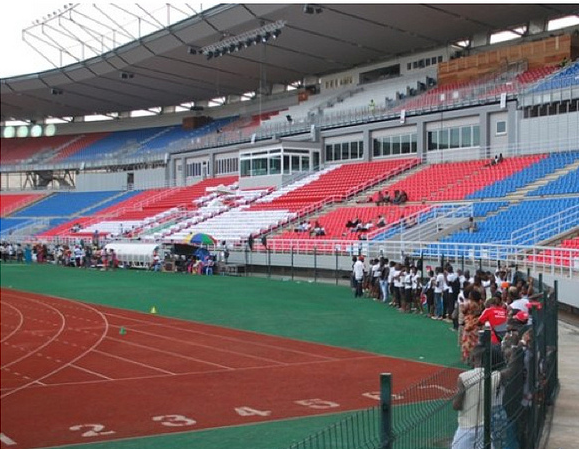 Co-host Equatorial Guinea will open the 28th Edition of the Africa Cup of Nations (AFCON 2012) with a match against Libya in the newly remodeled Bata Stadium tomorrow, Saturday, January 21, 2012 in Bata, the country’s largest city. The Nzalang National team is led in this tournament by their new coach, Brazilian Gílson Paulo. 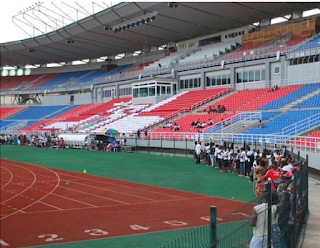 The Bata Stadium is a state-of–the-art venue and one of the many infrastructure projects in which the government of Equatorial Guinea has invested in recent years. The country has pulled out all the stops to welcome the participating African teams, thousands of fans, and journalists from around the world. Hotels are filled to capacity, and the government has arranged overflow lodgings in private properties and subsidized housing units that are to be distributed to low-income families after the games. Extra flights have been added to accommodate the many people who will travel between the two tournament venues, Bata and the capital, Malabo. Malabo is located on the island of Bioko, some 45 minutes by air from the mainland city of Bata. Teodoro Nguema Obiang Mangue, Equatorial Guinea’s Minister of Agriculture and Forestry, offered the national football team, nicknamed Nzalang National, a US$1m bonus if they win the opening game of the African Cup of Nations against Libya on Saturday, January 21, 2012 in Bata. To give the team further incentive, Minister Nguema also offered approximately US$20,000 for every goal the team scores. This bonus was offered when Minister Nguema visited the team on Monday, January 16, 2012. He did it to motivate the team. “The news has given the players an injection of enthusiasm and morale. It shows the popular support everybody has for the team,” federation spokesman David Monsuy told BBC. Equatorial Guinea’s Minister of Youth and Sports, Francisco Pascual Obama and Ruslan Eyegue Obiang, CEO of the COCAN G.E., also attended the meeting. The group took pictures with the team and coaching staff to promote the incentives. After the game against Libya, Equatorial Guinea will play Senegal on January 25th and Zambia January 29th in Malabo. The 2012 African Cup of Nations will end in Gabon on Sunday, February 12, 2012. President Obiang Nguema Mbasogo of Equatorial Guinea presided over the inauguration of the new tourist resort in the mainland city of Bata on December 29. The new tourist resort, Elik Melen, is the latest project in the government’s plan to build a tourism infrastructure in the West African country. In his remarks, President Obiang said the new tourist complex is one of many recent projects the country has supported to develop its political, economical and social sectors. He stressed his commitment to ensure Equatorial Guinea is recognized as a safe and stable country in the international community. In his speech, President Obiang shared his plan to support additional improvements to national industries and encouraged national banks to provide needed private capital. He then congratulated Lucas Nguema Esono Mbang, who helped acquire financial support from banking institutions to build the tourist complex, and called on all citizens to carry on similar projects. To bring the ceremony to a close, the Bishop of the Diocese of Bata, Juan Matogo Oyana blessed the resort. President Obiang followed by cutting the ribbon and inviting the guests to visit the different facilities at the hotel. In celebration of Christmas, Teodoro Nguema Obiang Mangue, Minister of Agriculture and Forestry and President of the Youth Federation PDGE, is hosting his annual toy distribution. He is giving toys to children throughout the country, as he has in previous years, with assistance from Miss South Africa 2008 and Miss Equatorial Guinea. In addition, Minister Nguema is also hosting concerts in Malabo and Bata from December 31 until today, January 3, with performances from Latino and African artists. The artists included Miki James, Cubanitos 2002, Flegor, Timaya, Don Dabany, Petit Pays, Arnold Eyelid, Boban MP3, Cabel, Chomi, tkz, Fally Ipupa, among many others. The toy distribution tour began in Malabo on Friday, December 23, where Minister Nguema donated toys to children at the General Hospital of Malabo, Guadalupe Clinic, Hospital Loeri Combá and the Hospital La Paz. He then continued his route in Bata Saturday, December 24, distributing toys to children at Asonga Bata, Hopital La Paz, Children’s Villages SOS and REMAR Bata Center. On Sunday, December 25, Minister Nguema distributed toys in Mongomo, Mongomeyen, Nsang Ayong, Añisok and Ayene. On Monday, December 26 he gave away toys in Luba, Batete, Moca, Riaba and respective hospitals. On Tuesday, December 27 he gave away toys in Baney and at Baney’s Hospital, in Rebola and at Rebola Hospital. On Wednesday, December 28 he gave away toys in Mbini and Kogo and at respective hospitals. On Thursday, December 29 he gave away toys in Niefang, Nkimi, Nkumequieñ, Maan Mení, Evinayong, Misión San Jose, Bikurga and Taga Eté. On Friday, December 30 he gave away toys in Mikomeseng, Nsok Nsomo, Nsang and Nkue. After the concerts, Minister Nguema will continue his toy distribution program on Thursday, January 5, visiting children in Ebebiyin, Bidjabidjan and Alen Angok. He will then bring his tour to a close on Saturday, January 7 in Annobón.